If you have missing teeth and would like to replace them with natural looking restorations then you may have previously looked at either partial dentures or bridges. But how would you like to replace your missing teeth using fixed restorations that could last a lifetime? Now that dentures and bridges are not your only options, why not consider dental implants. A dental implant is a small metal screw (normally made from titanium) that is surgically placed into the jawbone. After the surgical procedure you will need to wait for your jawbone to successfully fuse to the implanted titanium rod, ensuring that the base of your implant is strong and secure. This acts like the root of your tooth to which a partial denture, crown or bridge will be attached (depending on your situation). 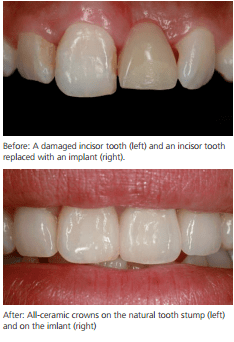 The implant essentially acts like your tooth’s root and the crown replaces the tooth. Regardless of whether you have one or several missing teeth, dental implants will offer you a long term and durable fixed solution to missing teeth that should last you a lifetime providing you maintain good oral hygiene. Although bridges and partial dentures are able to suitably provide you with a natural looking smile, they inevitably compromise the strength and stability of your existing teeth. That’s because they rely on and use your existing healthy teeth as pillars of support. Dental implants are independent structures and do not apply additional stress to your healthy teeth, meaning that this type of restoration does not come with a ‘biological price’. If you were to choose City Dental Practice, rest assured that only the most highly trained and experienced implant surgeons will place your dental implants. This gives you the assurance you need to go ahead with this procedure without any doubt in your mind that you have chosen the best dental practice in town to offer you a beautiful, full and natural looking smile. If you are considering dental implants or would like more information about the procedure, it would be great to speak with you more within a complimentary consultation. During our consultation we will be able to discuss your requirements in detail to determine if implants are the best available solution for you. To book your complimentary dental implant consultation, or if it is time for your regular exam and you would like to book an appointment, please call our friendly reception team on 0121 455 9233.